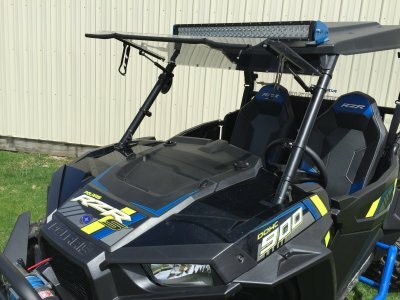 Polaris RZR XP1K, 2016 RZR 1000-S and 2015-16 RZR 900 One-Piece Flip Up Windshield Fits: 2014-16 XP1K (including the XP1K-4), 2016 RZR-S 1000 and the 2015-16 RZR 900 Made from Hard-Coated Polycarbonate (Hard-Coated on both sides). Adjusts to four positions; open, closed and two vented postions. Seals along the top. Gas Struts hold it open. Made In Cleveland, Ohio. This Hard Coated Windshield adjusts to four positions; open, closed, and two vented positions. The gas struts hold it open for hunting and while driving less than 5 MPH such as around the campsite etc. The two vented positions allow for airflow on warm days while still providing protection from the wind, rain and snow. The fully closed position is great for cold days. This windshield runs all the way to the top just under your stock visor keeping out the cold air. This is great option when running with a canvas cab or in the winter if you have a heater. Polycarbonate will not easily crack like cheaper materials such as Acrylic. It is virtually unbreakable under normal conditions. The hard coating is applied to both sides so that it will not easily scratch on the trail or when cleaning. With just a little bit of care this may be the last windshield you have to buy for your buggy. All the mounting hardware is made from Billet aluminum and steel, making it very durable.